AidData helps make information on development finance more functional through geocoding – the tagging of projects and activities with precise geographic information, which allows for dynamic maps and further in-depth analysis based on where project activities are taking place. Geocoding facilitates the efforts of stakeholders to monitor where aid flows are going, evaluate effectiveness, and reduce inefficiencies. 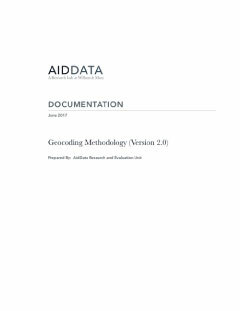 AidData’s geocoding methodology has become a global standard, incorporated into the International Aid Transparency Initiative (IATI) Standard. Geocoding tags the locations of specific development projects and activities, allowing people to see who is funding what and where within a given country. AidData’s original geocoding methodology (version 1.1) was created in partnership with the Uppsala Conflict Data Program (UCDP). Our new geocoding methodology (version 2.0) was released June 2017. AidData has successfully trained governments, donors and civil society organizations in numerous countries to use our internationally recognized geocoding methodology to assign latitudes and longitudes to components of foreign aid projects. Collect, standardize, and organize geospatial data. Apply geographic coordinates and activity codes to project data, enabling this information to be used in maps and visualizations. Prepare visualizations and analytics leveraging geospatial data. Create interactive maps and custom dashboards with geocoded data, that can be used to evaluate current aid flows and inform future funding allocations. 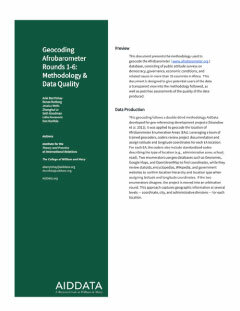 Provide assessments and recommendations to institutionalize geocoding practices. Conduct assessments and advise on how organizations can collect, code, and manage their geocoded information for the long-term. Build and implement custom information technology solutions. Design geo-enabled applications that extend existing client systems to sustainably collect real-time data and increase accessibility to broader user groups.